Bath City chairman Paul Williams says they will still talk to the organisers of a bid to buy the club, despite it falling short of a funding target. 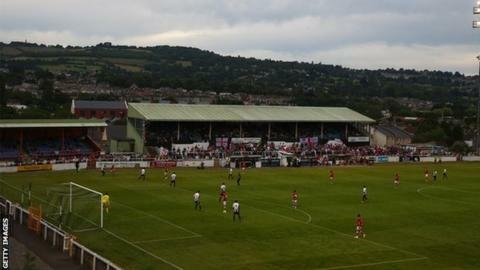 A campaign to buy the National League South side, named the Big Bath City Bid, fell short of its £750,000 target. But Williams says the club is open to talk to the organisers if they use the existing funds that they have raised. "If they continue to fundraise and it works with the board then we will continue a dialogue," Williams said. Speaking to BBC Points West, Williams admits that the club could raise money from elsewhere if the bid's organisers cannot offer funding. "The problem is that the minimum amount they were set was £750,000 and they have fallen a long way short of that in the timescale that they set themselves," he added. "Either we have to make some sort of arrangement with the bid team, to find out whether some of their funds can be resourced to us or we have to look at other avenues. "Ultimately, we have to be convinced that anything they come up with is for the long term sustainable benefit of the football club because that's what we're here to secure." The bid, which was backed by former Manchester United striker Eric Cantona, raised £303,276 of its £750,000 minimum target before the deadline on 4 September.